LED Light Bars are a super-easy way to add some extra-bright and colorful illumination to your project. Each Light Bar is essentially a set of three super-bright 5050-size LEDs. They're offered in a variety of colors including white, red, blue, and green (note: the blue and green light bars are an older version, they look different but can still be connected the same way). While these bars are very simple devices, they do have a few quirks when it comes to using them. Like the fact that their nominal operating voltage is 12V. 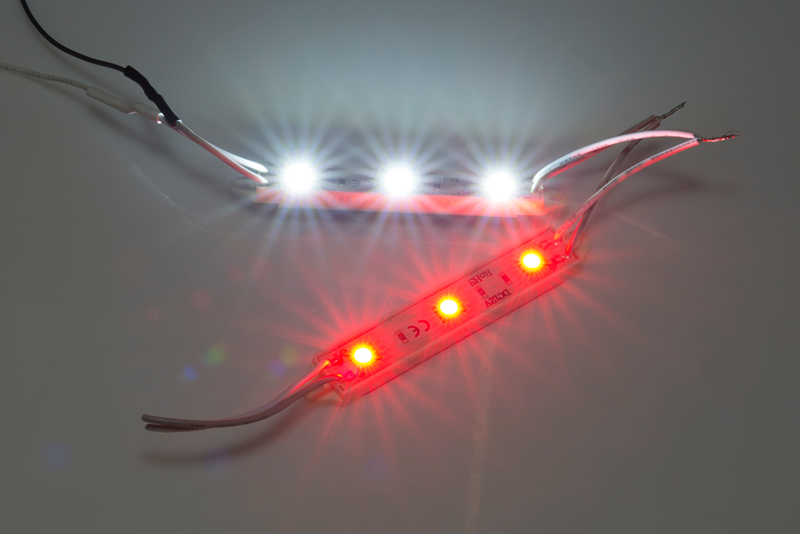 In this tutorial we'll go over some of the important specifications of these LED Light Bars. Then we'll dive into some example circuits that can help you get the most of these nifty little LED assemblies. Light Emitting Diodes (LEDs) -- This tutorial will help familiarize you with the LED lexicon. Polarity -- These LED Light Bars are polarized. Don't mix up the + and -! Working with Wire -- It'll be good to know how to strip, tin, and splice wire. Pulse Width Modulation (PWM) -- PWM is a popular method to dim LEDs with a digital signal. What is an Arduino? -- One of our examples will an Arduino, a beginner-friendly programmable microcontroller, to help dim the Light Bars.